I'm still a bit bummed that, during my time at Shanghai Disneyland last December, I was unable to ride Roaring Rapids (which was down for refurbishment) and unable to experience the Camp Discovery challenge trails, which were extremely busy each time I passed by. This was really the one major part of the park I didn't explore, and though that serves as motivation to return soon, I still wish I'd been able to sample the apparently legitimately difficult climbing courses available within. Until that time comes that allows me a second chance, I guess I'll just have to make do with these photos of an alluring Roaring Mountain, looking mighty and prominent. 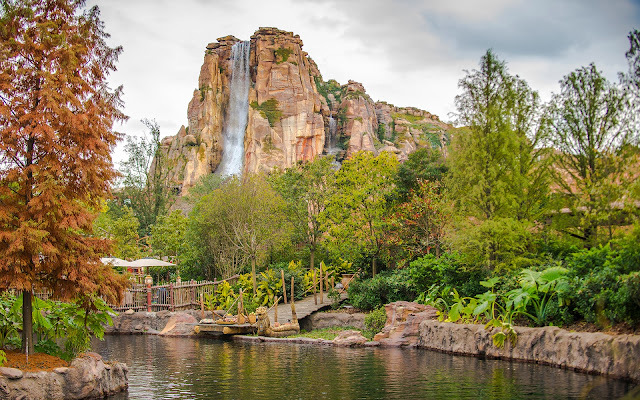 Roaring Mountain beckons beyond, in the wilderness.